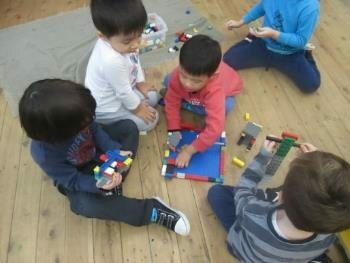 In the Montessori classroom: children are confident and involved learners (EYLF Outcome 4). pencils, further developing our fine motor skills. Here we see our friends hard at work making some gifts for our loved ones for Easter with Zahra. Emile tells his friend “Today I am going to make Orange juice, would you like some too?”. Not only is Emile developing his practical skills in squeezing an orange, he is also role-modelling sharing and friendly behaviour towards his peers within the classroom. Marcus is extending his knowledge of the broad stair and pink tower. 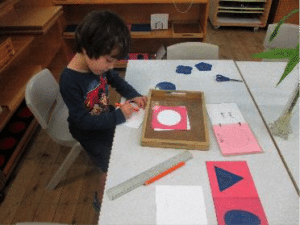 He spends a good part of the morning completing this activity, showing good concentration but also using his initiative to adapt materials to benefit his learning needs. 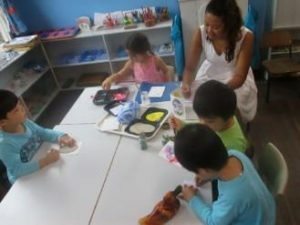 During group time the teachers introduce the children to a variety of materials which they will be using to create their Easter Cards for Mummy and Daddy. School Readiness: Children develop disposition for learning such as curiosity, cooperation, and enthusiasm (EYLF Outcome 4.1). We continued our Easter preparations with the painting of our Happy Easter sign and He is alive sign for our Easter Service. 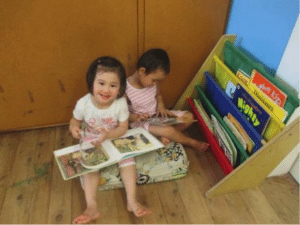 Indoor activities: Children develop dispositions for learning such as curiosity, cooperation, confidence, creativity, commitment, enthusiasm, persistence and imagination (EYLF Outcome 4.1). This week, children have been using construction materials with interest and curiosity. Lucas, Elijah and Jeremy were building with wooden blocks. 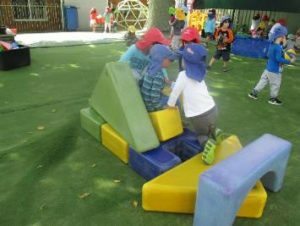 They worked together as a team to build a house. Selina and Aiden on the other hand used another set of wooden blocks to form a tube. This was so they could transport marbles from one side to the next. The children expressed their fun and excitement with their peers and teachers. Athens, Emile, Lucas, Benjamin and Jeremy progressively worked together constructing with Mini Legos. They described it as “building a house for their transformers”. Then they continued to build individual spaceships. Outdoor activities: Children take increasing responsibility for their own health and physical wellbeing (EYLF Outcome 3.2). 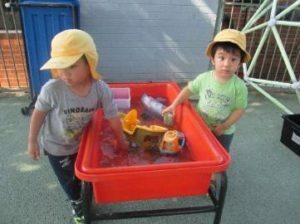 We were blessed with warm, sunny weather which enabled us to bring out some water play activities and spend more time outdoors! Here we see Owen and Abigail busy cleaning our outdoor chair using a sponge and some soapy water. Great job friends! knowledge and combining that with their imagination they were able to come up with a structure that resembled a house. Hillary is helping to take care of our outdoor environment. She was busy filling the watering cans with a variety of different sized containers before watering the garden. Our Munch & Move activities, encourages children’s physical activity and develops good gross motor skills using a range of fun, play-based learning experiences including ball activities. We practiced throwing, catching, rolling and kicking a ball, all of which also develop hand-eye coordination. 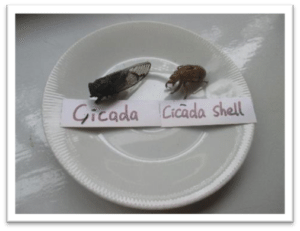 Craft: children transfer and adapt what they have learned from one context to another (EYLF Outcome 4.3). In continuing with our Easter Theme, children excitedly made a chick using a variety of papers in shapes and colours, they worked on their fine motor skills and creativity to make their own chicks with a variety of personalities! Special Occasions: children become strong in their social and emotional wellbeing (EYLF Outcome 3.1). This week we celebrated Elijah and Elise’s 4th Birthday. Jina and Natalie perform the children’s birthday walks, which is an ongoing story about their journeys through life so far, until the current day. The lit red candle, represents the sun and the walking around the ellipse carrying the globe symbolises the years they have experienced here in this world. Hope you both enjoyed your birthdays and continued celebrations with family. Church: Bible Story – Here you can see us continuing our Easter Story during Church. In this week’s part of the story, Jesus was arrested and taken before the Roman Governor – Pontius Pilate. Pilate was convinced by the enemies of Jesus that he deserved to die. The children listened attentively to the story and asked relevant questions. The children have also been practicing our Easter songs, with Patty and within our group singing at the end of our Montessori Program. Jesus willingly went to the cross, because he loved us. He wanted to make it possible for God to have us in his family. Praise the Lord!